George M. Clark was born on November 21, 1875. He moved to Bad Axe, Michigan, in 1881 and received his high school education in that village. Following graduation, he worked in Huron County as a rural schoolteacher. In 1898 he commenced his first term as County Clerk of Huron County, and served until December 31, 1903. During this period he pursued a course of study in law under the direction of William T. Bope and commenced the practice of law in Bad Axe on January 1, 1905. 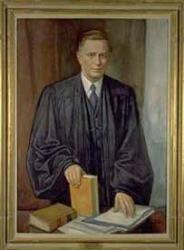 He enjoyed a very successful practice in his community, which continued until his appointment by Governor Albert E. Sleeper to the Michigan Supreme Court on December 30, 1919. Clark had amazing intellectual abilities in light of the fact that he never benefited from a formal college education. He was noted for his brevity and his directness of speech and action. Following his terms of service on the Court, he returned to private practice in 1933, in Muskegon and Detroit, which continued until 1945. In the meantime, he satisfied a life-long ambition to live on a farm by purchasing one in Caseville, Michigan where he continued to reside following his retirement until his death on March 28, 1951.